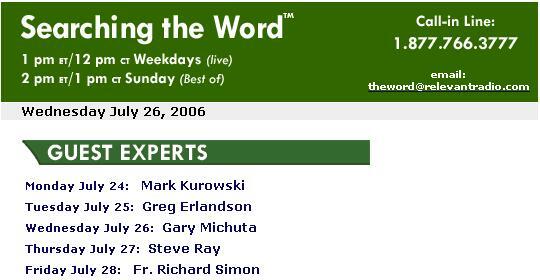 Steve joined Chuck Neff on Relevant Radio's "Searching the Word" on Thursday at 1 PM EST. For more info, click on the sign to the right. What about salvation? Are we saved by faith or works? Click here to listen to Steve's talk on "Abraham and "Faith Alone" or click here to purchase his talk. What about the NIV translation of the Bible? Also, listen to the archived show for anwswers about 1) fallen away family members, 2) baptism by desire, 3) what is worship, and more. "Our five-year old daughter Anna Maria (and we of course) loves to watch your "Footprints of God." One day she said, "I love Steve Ray. He leads us to the true faith!" Anna Maria also said she would like to meet you sometime." Well, I would sure like to meet her too!